To Get Kids To Class, LA Softens Its Hard Line After several years of a punitive approach to school truancy — complete with police sweeps around campuses and fines — Los Angeles is shifting its focus to the root causes of why kids skip school. Critics say the hard-line policies penalized low-income families and failed to improve attendance. 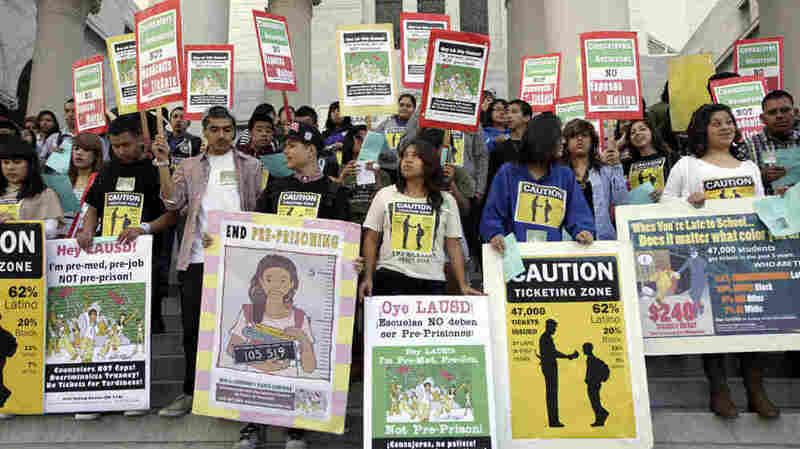 Los Angeles is easing its stance on truancy. For the past decade, a tough city ordinance slapped huge fines on students for even one instance of skipping school or being late, but the Los Angeles City Council is changing that law to focus on helping students get to class because it turns out those harsh fines were backfiring. Two years ago, Nabil Romero, a young Angeleno with a thin black mustache, was running late to his first period at a public high school on LA's Westside. "I live two bus rides away from my school," he says. "The first bus ride took 45 minutes; the second one did as well. By the time I arrived [at] school, I was approached by police officers and I was told to stop. I was handcuffed, searched." Romero had to pay a $350 truancy fine — a lot in a single-parent home like his. "When my mom heard the fine, she was like, 'Oh, we're gong to have to cut back on a lot of stuff,' and we started cutting back on food expenses, clothes expenses, shoes," he recalls. "And this was all my fault." Well, maybe not all his fault. The ticket Romero got was for breaking the city of LA's daytime curfew law — a law that, critics say, often punishes low-income kids making an honest effort to get to school. Manuel Criollo, an organizer with LA's Community Rights Campaign, says he first started hearing stories like Romero's a few years ago, stories about police ticketing kids on their way to campus, or rounding them up at bus stops. "To be honest, all of us were like, 'OK, are you guys literally saying they're at the bus stop?' And we went out there, and yeah — literally, you had school police basically waiting for young people to give them tickets!" Criollo's group got ahold of police data showing that in five years, officers issued 47,000 truancy tickets — most right next to schools in lower-income neighborhoods. Blacks and Latinos received a disproportionate number of the tickets, compared with the makeup of the student population. The daytime curfew only applies to unaccompanied minors. Criollo points out that in richer neighborhoods, tardy kids often escape tickets because their parents drive them to school. Kids in poor neighborhoods usually rely on public buses. 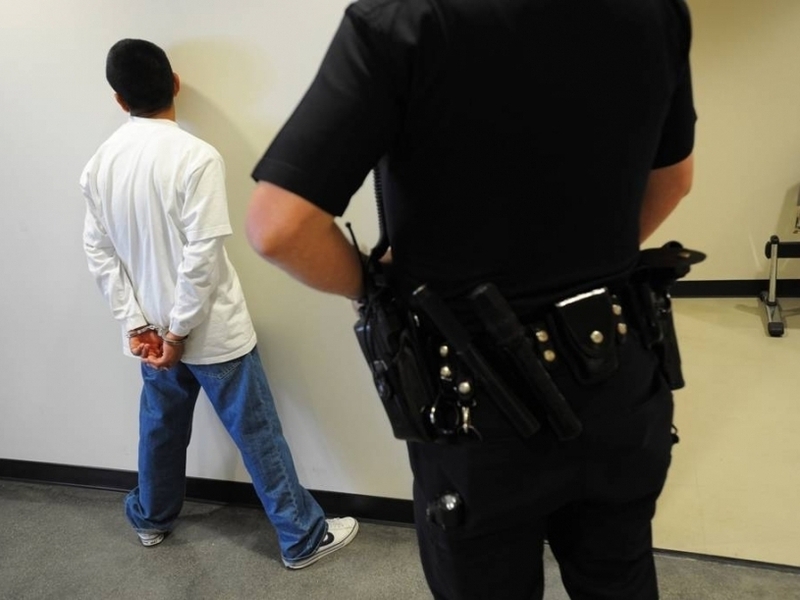 A Los Angeles police officer detains a San Pedro High School student in 2010 for truancy. After years of following a more punitive approach, Los Angeles is reconsidering how it handles students who skip class. At a recent rally to protest the law, teacher Andrew Terranova explains that tickets meant to scare kids into going to school have had the opposite effect. "I had students who I'd say, 'Where were you yesterday? You were absent from my class.' 'Oh, Mister, I was late. I missed my connecting bus so I went home.' 'Why'd you go home?' 'Oh, I was afraid of getting another truancy ticket.' "
Michael Nash, the presiding judge for LA's Juvenile Court, where most of the tickets and fines are handled, called the fines crazy. "We weren't really accomplishing anything," he says. "The court is not going to solve that problem if the kids are late to school. That's something for the schools to work out with the kids and the families." So now, under the new daytime curfew law, police must avoid targeting students clearly headed to campus in the first 90 minutes of school. "We have to take a look at what can we do to try and help us resolve the root problem of this rather than the Band-Aid approach of just writing the citation," says LA school police chief Steve Zipperman. When tickets are issued, fines will be waived for the first two offenses, and students will have to work with counselors to come up with an attendance plan — looking into transportation issues or family stuff that might be getting in the way. City Councilman Tony Cardenas recently summed up the city's new approach to a crowd of students inside city hall. "Young people, this is not a permission slip to be late. There are still consequences," he said. "However, instead of purely punishing like the current system, we will be there for you; we will be there with you." Believe it or not, Cardenas told them, an adult is actually going to talk to you, and help figure out how to get you to school on time. This story was co-reported with Susan Ferriss of the Center for Public Integrity.